Mr Green Casino is an online gaming site that has gained momentum in the online gambling market. Mr. Green offers hundreds of the most popular online casino games which includes many of the newest releases. They have a simple approach. Mr. Green makes everything super easy for the players which benefit both those new to online gaming as well as the experienced player. They are operated by one of the largest online gaming platforms which enables them to provide a variety of games and makes playing fun and easy. Mr. Green was founded in late 2007 and the website was launched in 2008 by Fredrik Sidfalk, Henrik Bergquist and Mikael Pawlo, three Swedish entrepreneurs. When they launched, Mr. Green become one of the first sites that offered games from a couple of different suppliers and created a new wallet solution where it was not required to exchange chips from a bunch of different vendors. Mr. Green now offers games from live casino supplier Evolution Gaming as well as Net Entertainment, Quickspin, Nextgen, Quickfire, Play&Go and Yggdrasil. Popular games titles including Mega Fortune, Hall of Gods,Cleopatra and BattleStar Galactica can be found on the Mr. Green Casino website. Mr Green’s Casino also doesn’t tie up your winnings with wagering requirements and allows you to withdraw your funds at any time. Mr. Green also allows you to set deposit limits to prevent you from depositing more than you had planned on. It also allows you to set loss limits so you don’t go over what you had planned on playing and you can set wagering limits so you can have fun responsibly. It’s easy to register an account with Mr. Green by entering a valid email address and a password with a few pieces of personal information. You will then receive a code that you must enter to finalize your registration. You are also allowed to play games without making a deposit. There is a ‘Play for free’ option to allow you to try out a game without having to play any actual money. You will find these games in the ‘Play for free’ mode. Reviews have indicated that Mr. Green is like on online casino playground. For five years in a row, Mr. Green has been rated the best online casino. Since it uses several different software providers, it’s easy for players to choose the best games from each of these providers. With the second chance bonus, you are able to continue to play once your own cash is used by using Mr. Green bonus cash. The bonus cash must be played 35 times before you can withdraw it for actual money. To do this, every slot spin you play using the bonus funds count towards your wagering requirement which is shown in your wagering bar. First-time players can receive a bonus of up to £100 by making their first deposit. The Welcome Deposit Bonus will be credited to your account and will be used once you have played the funds that you have deposited in your main account. This money also needs to be played 35 times before it can be withdrawn and the wagering requirements can only be satisfied when playing slots only. You can also receive free spins during the new customer registration promotion. There are no deposits required to receive your free spins and the money won will be credited to your bonus amount balance and must be played 35 times before it can be withdrawn as cash. You can meet the wagering requirements only by playing slots. Free spins that are not played with be lost after seven days and are only available on a specific game, you cannot transfer them. When players register their first account and deposit a minimum of £20m they are eligible to receive the One Hundred Deposit Bonus Spin Bonus. The Deposit Bonus Spins can only be received by a person once per account. The Deposit Bonus Spin gives customers a specific number of bonus spins on a specific game and cannot be transferred to another game. The bonus is only valid for 30 days and once the Deposit Bonus Spins are credited to your account you only have seven days to play them. The money won from Deposit Bonus Spins will be credit to your account and funds that have been deposited will be played before you can use the bonus money. The bonus money must also be played at 35 times before you can withdraw it. Mr. Green is licensed and regulated by the LGA, Maltese Lotteries & Gaming Authority with their main office located in Sliema, Malta. Mr Green & Co is the parent company and the largest company in their group. Because of licensing and regulatory legislation, players from the following countries cannot create accounts with Mr. Green: Afghanistan, Saudi Arabia, Cambodia, Somalia, Congo, Spain, Denmark, Sudan, Estonia, Syria, Ethiopia, Turkey, France, United States, Iran, Yemen, Iraq, French Guiana, Italy, Guadeloupe, Jordan, Martinique, Kuwait, Mayotte, Libya, New Caledonia, Moldavia, Palestine, Saint Pierre, Western Sahara and Wallis and Futuna. What can players expect at Mr. Green Casino? 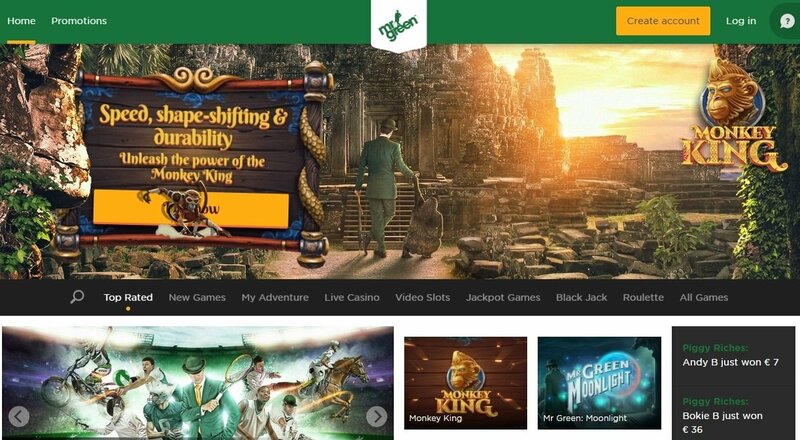 As one of the most established online gaming sites, Mr Green Casino has worked to develop the best user experience possible. Once you join the site, you will find that it is easy to start playing and you will always have a variety of games to choose from. Mr. Green Casino is powered by IGT and NetEnt with over 200 slot games available. Their customer support is offered in over a dozen languages and withdrawals have super fast processing. Each day you will also receive fabulous promotions in your email box. Mr. Green also works to educate its players on the responsibility of gaming by working with outside organizations to prevent gambling addiction. Responsible gaming is a priority for Mr. Green Casinos and is one of their main business strategies to ensure trust from their players.